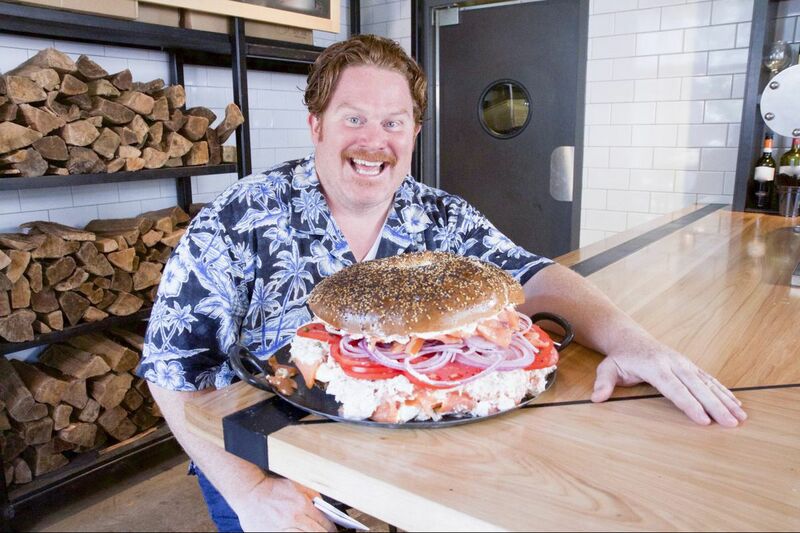 Host Casey Webb poses with Spread Bagelry's 13-pound Classic Whale Challenge, as seen on Travel Channel's Man v. Food. Travel Channel's Man v. Food last came to Philadelphia in 2009, when then-host Adam Richman took on Tony Luke's five-pound Ultimate Cheesesteak challenge. Now, the show's new host, Casey Webb, will show off another one of Philly's biggest dishes in an episode set to air Monday at 9 p.m. The problem, though: We already know about the food he's going to show us. In the episode, Webb, a release notes, will attempt to take down Spread Bagelry's Classic Whale Challenge. A 14-pound bagel sandwich consisting of salmon, white fish salad, cream cheese, and veggies, the challenge is easily one of the largest in the Philadelphia area. Which, of course, is probably why it has been featured on TV before. Almost exactly a year ago, Philly-born TV host Josh Denny featured The Whale on Food Network's Ginormous Food, a Man v. Food-like show. Before that, Audrina Patridge featured the Whale Challenge on NBC's 1st Look back in 2014. But no one really associates Philadelphia with Montreal-style bagels and all of these TV shows come to Philly to highlight a cuisine that's not really ours. In addition to The Whale, Webb is also taking on the 100/100 sandwich — two-feet of slow roasted pork, bacon, and cheese — at Jake's Sandwich Board, and an off-menu Mac 'n' Cheesesteak from Mac Mart. But we're so over The Whale. OK, so it technically isn't an "official" eating challenge, and it is going to be hard to beat Vice's presentation of it on The Pizza Show last year, but this is one of Philadelphia's most beloved food challenges. A Jim's cheesesteak wrapped in a giant slice of Lorenzo's Pizza, the challenge was created in 2003 by then-Philadelphia Weekly editor Jeff Barg, and has since become an iconic South Street activity. Bet you can't finish it. You might think you could put away 20 street-style tacos fairly easily, but after a few, these things start to stack up. Loco Pez, however, is nice, and let's you choose what kind of tacos you want to nearly kill yourself with, so that's a bonus. Finish all 20 to get a free T-shirt, but finish all 20 in under 6 minutes and 31 seconds, and your name will have a coveted spot on the restaurant's Gordo Board. Best to call ahead if you plan on taking the challenge (and no, you don't get it free). Sometimes, a cheesesteak just isn't enough, even if it weights three pounds. Jake's Sandwich Board knows this, so they added four soft pretzels, 12 Tastykakes, 24 peanut chews, and a cherry soda to the order for a challenge weighing in at five pounds. If you can finish up in 45 minutes, you'll get a T-shirt and a picture on the wall of fame, plus the meal will be free. Webb is already heading to Jake's but we think this challenge is worth more airtime. Thanks to multiple Buddy's locations in the Philadelphia area, the burger spot's Enemy Challenge shouldn't be hard to find. It consists of two eight-patty burgers, each with eight slices of cheese and four strips of bacon. Add to that two pounds of fries, and that's 5.5 pounds of food that needs to be eaten in under 25 minutes to win. The prize: A place on the wall of fame, a T-shirt, and a free meal. South Philly Bar & Grill's Grand Salami Challenge isn't a normal cheesesteak by any stretch of the imagination, thanks to the addition of genoa salami, mushrooms, peppers, and provolone, whiz, and American cheeses. But it is large, weighing in at around six pounds, and potentially free, if you can down the whole thing in 20 minutes or less. A bonus: The restaurant is located smack-dab in the middle of Cheesesteak Vegas, so getting those ubiquitous shots of Pat's and Geno's should be easy. The Kibitz Room's G.B.M.F., otherwise known as the 'Great Big Mother F—–,' will land you a spot on the restaurant's 'Wall of Shame' if you can finish the 6.5-pound sandwich in under 55 minutes. Consisting of corned beef, pastrami, turkey, roast beef, brisket, coleslaw, Russian dressing, and Swiss cheese, this one is served with sides of potato salad and coleslaw, and a pickle. If you fail, it will run you $50.